An alien artifact causes Daniel to disappear, and the team looks for help from his institutionalized grandfather -- unaware that their friend is still close by. A M.A.L.P. probe sent to P7X-377 discovers a gigantic pyramid on the apparently deserted planet — a pyramid over 1,000 meters high! Inside, down a long stone walkway and through high levels of neutrino radiation, sits a crystal skull atop a stone platform. The artifact — carved from a single piece of crystal — appears to be identical to a skull that Daniel Jackson’s grandfather, Nicholas Ballard, discovered in Belize, Central America in 1971. SG-1 visits the planet to investigate the object, although the high levels of radiation within the pyramid will limit their trip to just a few minutes. But when Daniel approaches the object, a circle of energy begins to swirl around him. Radiation levels begin to increase exponentially. Teal’c fires a zat gun at the object, and Daniel is thrown backward to the stone floor. But he is no longer visible to his teammates — he has disappeared. With Major Carter unconscious from the radiation, the three flee back to the Stargate, leaving Daniel invisible and unconscious. Teal’c’s symbiote allows him to recover from the radiation much quicker than the others, and he returns to bring the crystal skull back to Earth. 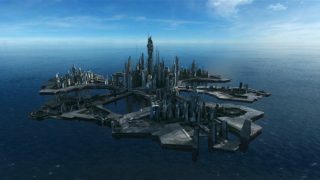 Daniel awakens as Teal’c turns to leave, and discovers that he is invisible — and immaterial, as Teal’c walks right through him. Daniel follows Teal’c back to the S.G.C., and must try to discover what has happened to him. He considers the possibility that he might be dead, since he is neither hungry nor thirsty. Meanwhile, base scientist Robert Rothman studies the artifact, and O’Neill, Carter, and Teal’c locate Nick Ballard and go to meet him. What Daniel did not tell them was that his grandfather had a strange experience with the crystal skull from Belize. He said that he was transported by the skull to a gigantic cavern, where he met “giant aliens” who said to him (in ancient Mayan), “The enemy of my enemy is my friend.” Ballard was ridiculed by the scientific community, and the aged man is now in a mental institution. Daniel follows the rest of SG-1 to the hospital and listens as they speak with Nick, trying to convince his grandfather that he should listen to them and tell them everything he knows. Nick is of little help, and insists on seeing the skull himself. The team brings him back to Cheyenne Mountain and gives him restricted access, telling him nothing of the Stargate or where the second skull was found. When Daniel and Nick are alone together, the old man reveals that he has been able to see and hear him the whole time — probably because he had gone through the same experience. Daniel is not dead, but out of phase with everyone else. He is overjoyed, and the two reconcile their past differences. Thanks to Daniel’s influence through Nick, General Hammond allows the team to return to the planet (along with Nick). Jackson’s theory is that Teal’c’s zat blast interrupted the crystal skull’s teleportation before it was completed, leaving him stuck in some sort of limbo. Back in the cavern, the skull is replaced and Daniel approaches it. Energy swirls around the group, and all are “transported” to the different phase — all except Teal’c, who sees O’Neill, Carter, and Ballard disappear. He returns to the Stargate. Daniel is reunited with the others, who can now see him. The giant alien whom Nick had encountered decades ago appears to them — an imposing, ethereal being named Quetzalcoatl. “The enemy of my enemy is my friend,” he says. Daniel realizes that the aliens are enemies of the Goa’uld — Teal’c was not transported because of his larval Goa’uld symbiote. “We are enemies of the Goa’uld!” Daniel exclaims. Rather than return to Earth, Nick agrees to stay with the aliens and exchange knowledge and culture. Daniel says goodbye to his grandfather, hoping that he will one day see him again. Daniel appeared to be unaffected by the neutrino radiation in the pyramid once he was out of phase. It is interesting to watch the ways in which he can and cannot interact with the normal universe: he could walk through people and through walls (he walked through the doors inside the hospital), but did not fall downward through the floor. Presumably, too, he was still breathing oxygen. Daniel was also able to be transported through the Stargate’s wormhole, which disintegrated the matter making up his body on one side and reintegrated it on the other. Daniel’s condition was reminiscent of the Re’tu, who are invisible because they are 180 degrees out of phase with normal matter (“Show and Tell”). The Re’tu, however, were apparently not immaterial, as Daniel was. They could fire a weapon in our normal phase, which made them visible for a brief moment. Teal’c was able to sense Daniel’s presence on at least two occasions: when here turned to acquire the crystal skull from the pyramid, and when he was meditating in his quarters. His symbiote may give him some subtle form of extrasensory perception. When he discovered the crystal skull in Belize in 1971, Nick was apparently transported to the location of the second skull off-world, as well as into the out-of-phase dimension. The skulls may serve as some sort of transportation network, with multiple skulls throughout the galaxy. Perhaps the aliens even use them to deliberately bring other lifeforms to them, so that they might make alliances against the Goa’uld. An alternate explanation is that Nick was never transported off of Earth at all, but that at least one alien was living on Earth in the pyramid he was exploring. At first glance, it may seem as though Nick’s mental illness contradicts Dr. Fraiser’s statement that Daniel has no history of mental illness in his family history (“Legacy”). But she specifically referred to schizophrenia in that episode — a very specific mental illness that was not associated with Nick Ballard. Production glitch: the video appears to skip a frame or two just before Nick replaces the skull on the pedestal. Daniel Jackson – Daniel claimed that the pyramids of Egypt were landing sites for alien spacecraft, and was shunned by the scientific community (he made less-specific claims about the pyramids in “Stargate” the Movie). He continued to publish after joining the Stargate program, but has not published a paper in two years. Daniel was 8 years old when his foster parents died (“The Gamekeeper”). He visited his grandfather at the mental hospital regularly up until four years ago, before he joined the Stargate program. Teal’c – Teal’c’s symbiote may give him some subtle form of extrasensory perception. He was able to sense Daniel’s presence, though he apparently could not identify the sensation. George Hammond – General Hammond has granddaughters named Kayla and Tessa. Was Nick transported off of Earth in 1971? Will Daniel see his grandfather again? Why are the aliens enemies of the Goa’uld? Is Quetzalcoatl the only alien residing on the alien world, or is he one of a species? Do the Goa’uld know about these aliens? Are they currently at war with them? VOTE! 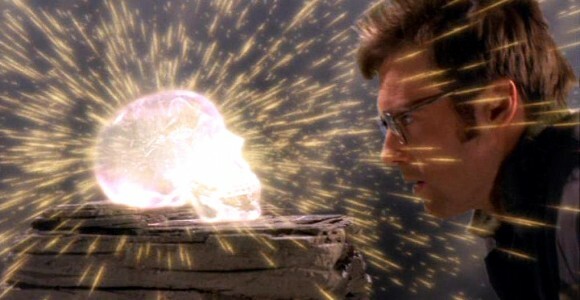 How would you rate SG-1's "Crystal Skull?"